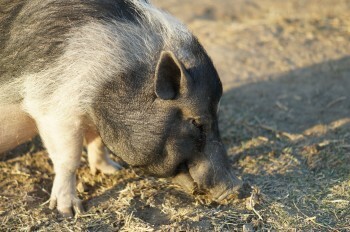 Mohawk the Pig is one of our “founders” (Read: First rescued animals of Harvest Home Animal Sanctuary). Before his arrival at the sanctuary, young Mohawk was mauled by a pack of dogs and taken to a nearby city shelter. Northern California Potbellied Pig Rescue helped him recover, and at two years of age he came to live with us at Harvest Home Animal Sanctuary in order to provide us with an endless amount of entertainment, excitement and love. Mohawk’s road to recovery from the canine attack was a long process. Post-recovery, Mohawk was ready to start anew at our sanctuary. His new life in Stockton was porcine perfect. He enjoyed every moment of sunbathing and rooting in our green pasture. He would never turn away a belly rub from a visiting human. In 2009, however, middle-aged Mohawk faced an unexpected challenge to his life once again. He developed an acute urinary tract infection. He underwent two invasive surgical procedures at UC Davis to save his life. He was hospitalized for three weeks. The cost of these lifesaving efforts totaled $6,000. For months, Mohawk’s health status was touch and go. Today, Mohawk is on a strict regime of prescription drugs (27 pills per day) to maintain his good health. We’re happy to report Mohawk is back to his old habits of rooting and sun-tanning at the sanctuary. Life is good once again for our dear Mo-Mo.